According to a study carried out by the National Institute for Public Health and the Environment (RIVM), health effects due to exposure to titanium dioxide nanoparticles via food, food supplements and toothpastes cannot be excluded. RIVM has investigated the health effects of the fraction of nanoparticles as present in the white colourant titanium dioxide. The findings have been published in the scientific journal Nanotoxicology. Titanium dioxide is a powdery, white colourant used in a wide variety of products. Titanium dioxide is mentioned on the ingredient list of food products as additive E171 or titanium dioxide. On toothpaste, titanium dioxide is indicated by CI 77891. A small fraction of the poorly soluble titanium dioxide particles in this white powder is smaller than 100 nm (which is referred to as a nanoparticle). No limit has been set for the amount of titanium dioxide that man can daily ingest. It is nowadays known that very small particles, such as nanoparticles, can behave differently from larger particles of the same chemical composition. The small particles have a relative large surface area and can therefore be reactive and may cause harmful effects. In addition, they may end up at different sites in the human body. Because of these recent insights RIVM has investigated potential health risks due to exposure to titanium dioxide. 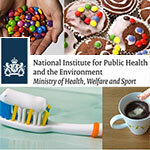 First, RIVM estimated the amount of titanium dioxide nanoparticles that the Dutch consumer daily ingests via food, food supplements and toothpaste. This was calculated by using measured concentrations in food products and toothpaste, which were linked to information on the intake of food products. The products contributing most to the intake of TiO2 are toothpaste (in young children only), candy, coffee creamer, fine bakery wares and sauces. Second, RIVM performed a risk assessment by estimating the concentration of titanium dioxide nanoparticles in human liver, and subsequent comparison to the concentration in the liver of test animals for which adverse effects were found. The accumulation of particles in time was taken into account in these calculations. Based on this investigation and considering the differences between man and animals and sensitive people, it appears that liver effects cannot be excluded. To gain better insight into the likelihood of effects after long-term exposure (such as via food), RIVM recommends further research.